Welch Allyn extended warranty programs are designed to maximise the availability of your Welch Allyn devices and give you peace of mind that your Welch Allyn devices will always be available when you need them. 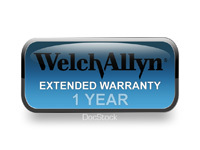 With an extended warranty, you can continue your protection long after your original warranty has expired. In the event your device fails to perform as specified (with the exception of misuse or damage) Welch Allyn will repair or replace it at no cost to you.